Does January seem like a never-ending month to you too? Most months fly by before I’ve really registered their arrival, but this one seems to inch forward like a blob of molasses. Of course it doesn’t help that I spend most of the month in a kind of food purgatory. On one hand I’m actively trying to avoid even hearing the words ‘light’, ‘healthy’ and ‘diet-friendly’ let alone eating anything that could be described as such. I mean really, who wants to diet now, when the days are at their darkest, the weather at its worst and nothing but roots and crucifers are in season? Give me food that’s going to comfort, not depress! On the other hand, though, even I feel the need to atone for my end-of-the-year sins. I don’t know what it is about December, but each year all my plans for moderation last all of about ten minutes before being quashed by the mantra: “oh well, it’s the holidays!”. This is the kind of thinking that begins with justifying an extra cookie with my afternoon coffee and ends with me drinking spiked eggnog for breakfast and having three helpings of dessert after every meal. And then I wonder why I feel so lousy by the end. So it’s inevitable that in January I try to regain some balance. It’s nothing as drastic as dieting, you know, just a return to more sensible ways: booze, sugar and white flour are (mostly) out, meat and cheese are minimized, and vegetables and whole grains are the focus. Meals should be neither too large nor too small, neither spartan nor indulgent, but wholesome and satisfying—and delicious enough that I can momentarily forget that I’m doing something good for myself. One of my all-time favorite, tried-and-true meals in this category is the following pasta. I can’t believe I’ve never told you about it, in fact, since it’s something I’ve been making for literally decades. I clipped it out of a magazine during my vegetarian teens and liked it so much I never stopped making it. It’s a brilliantly simple idea: you just roast some sliced carrots, onions and garlic in the oven until soft and caramelized, then blend them up with vegetable (or chicken) broth into a rustic, surprisingly full-flavored sauce for pasta. That was as far as the original recipe went (at least as far as I remember; I’ve long since lost the clipping), but over the years a little thyme and crème fraîche crept their way in too, along with a finishing crunch of toasted nuts. I also started using whole wheat pasta which in addition to squeezing out a few more health benefits adds a wonderful heartiness. The end result is pretty much perfect January food: it ticks all the nutrition boxes, is made with things that I almost always have on hand, and tastes deceptively rich and complex. Most importantly, as pasta in creamy sauces tends to be, it’s deeply comforting—almost (but not quite) as much as knowing that February is right around the corner. Preheat the oven to 400F/200C. Toss the carrots, onion, garlic, thyme and oil together in a bowl, then spread them out on a foil-covered baking sheet in a single layer. Roast until the carrots are tender and flecked with brown, about 45 minutes, stirring a couple of times and removing the garlic early if it starts to over-brown. Peel the garlic cloves and puree with the rest of the vegetables in a food processor or blender, adding as much broth as necessary to make a thick, creamy sauce. Blend in the crème fraîche. Taste and add salt and pepper as needed. 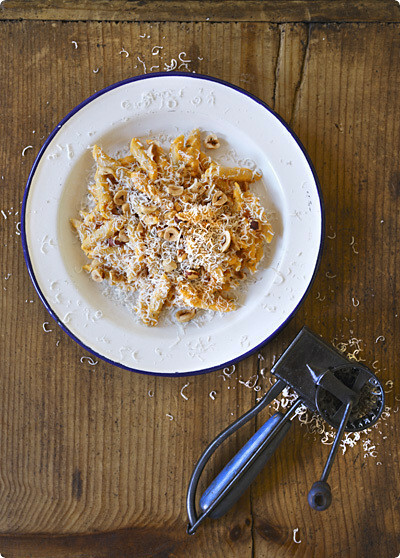 Toss with hot cooked pasta and top with a sprinkling of cheese and toasted nuts. I know exactly what you are talking about. I can't diet, the idea itself makes me get fatter. Sometimes my body is begging for a break from heavy food, but my spirit is asking for comfort. I normally don't consider carrots, especially with pasta, but I've come to trust your taste in matters of food, and this type of recipe is what I need right now. That recipe looks so delicious! I just printed a copy and will make it in the coming days. And I truly have everything for it at home already 🙂 Looking forward to it already! It was just a few hours ago when I talked with a friend of mine about how we already can't nwait for spring to come. I mean there is nothing wrong about winter. I actually love the cold and all that snow but every year when the months turn into February and especially March I'm finding my self all too often thinking "Would it be spring already!". For me the worst in winter is the darkness. We don't see much of the sun here in Finland for far too many months…. Well, the summer is that much more beautiful and full of light. It all gets somehow balanced, I guess.What an interesting new way to enjoy pasta. Never thought about a pasta sauce made of carrots. Have to make this winter comfort food in the coming days! Why do I never think of carrots and pasta? That sauce looks lovely! Love this! Roasted carrot sauce on pasta, what a great idea. I think that this is going to be my dinner tomorrow night, since tonight is shrimp enchiladas. For me, they're an example of the January eating that I like–not too heavy, not too light. You really perfectly summed up how I behave/think/feel about food around the holidays, and in January. Very nice. I wonder if subbing some parsnips for a few of the carrots would make it too intense? I love roasted parsnips…I'll let you know how it turns out. Unfortunately, I am one of those that counts calories. Even in the winter! I am going to try this recipe, looks healthy and since the creme is not cooked, I think I may try to use Greek-style yogurt in place of the sour cream. I have just come across your blog and really enjoy reading it. Your recipe sound delicious and the photo are so lovely. The best thing about cooking and eating is that we enjoy it with a very special memory with people we share it with. I made this tonight. It was so good that I promptly emailed eight of my favorite people to tell them.Thank you.P.S. I used Harold McGee's method of cooking pasta — skillet, cold water/broth, medium heat. 20min. Revolutionary. P.P.S. We ate it with some roasted spiced chickpeas and some torn up but not really wilted spinach. So. Good. Making this recipe today for the second time. We really enjoyed it the first time around.